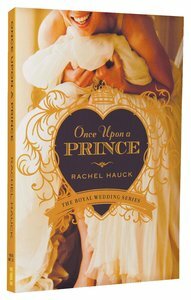 Once Upon a Prince, the first novel in the Royal Wedding series by bestselling author Rachel Hauck, treats you to a modern-day fairy tale. Susanna Truitt never dreamed of a great romance or being treated like a princess---just to marry the man she has loved for twelve years. But life isn't going according to plan. When her high-school-sweetheart-turned-Marine-officer breaks up instead of proposing, Susanna scrambles to rebuild her life. The last thing Prince Nathaniel expects to find on his American holiday to St. Simon's Island is the queen of his heart. A prince has duties, and his family's tense political situation has chosen his bride for him. When Prince Nathaniel comes to Susanna's aid under the fabled Lover's Oak, he is blindsided by love. Their lives are worlds apart. He's a royal prince. She's a ordinary girl. But everything changes when Susanna receives an invitation to Nathaniel's coronation. It's the ultimate choice. His kingdom or her heart? God's will or their own? About "Once Upon a Prince (#01 in The Royal Wedding Series)"
Customer Reviews For "Once Upon a Prince (#01 in The Royal Wedding Series)"
I had already read the last book in this series, and did not enjoy it, so I was very surprised to find that I loved this novel! It reminded me of all my favourite 'Cinderella' movies, such as 'The Princess Diaries' and 'The Prince and Me': a small town girl from a very normal (read - quirky and embarassing) family meets a prince-in-hiding and...well, you can guess what happens! But what I absolutely loved about this novel was the strong Christian theme about fully submitting to God's Will, no matter what It might be. I now want to watch the movie version! Despite quite a few similarities to the Princess Diaries, I enjoyed this tale of responsibility and recognizing the things we do out of fear. This is the first book in the Royal Wedding series. Having read the second book first I wasn't eager to read this one but was encouraged to and was so glad I did. The books in this series revolve around the history of two small kingdomsduchy and an entailment arrangement made 100yrs earlier. I found this history a little hard to understand at first but quickly became absorbed in the story. Nathaniel and Susanna, the two main characters are shining lights of integrity and depth of faith. I felt so encouraged by their character and choices and finished the book, which does end happily, inspired to deepen my relationship with God and trust Him more with my future. I also decided to reread the second book as now I understand so much more of the history. While this wasn't the best book I've ever read, it was a long way from the worst! I really enjoyed the   characters, especially their integrity in the midst of some tough circumstances and the way they related to each other. They were both really sweet. I felt like the history lessons bogged down the storyline a little, though since they were important to understanding the story don't know how that could have been avoided. Being a romance, and a modern day fairytale, the ending was fairly predictable - which in no way diminished its delight. I might have gotten bogged down in the middle, but I loved the end! This was a delightful fairy tale that had Crown Prince Nathaniel scrubbing toilets and waiting tables in Susanna Truitt's family owned seaside cafe. She's just been right-royally dumped after a very long courtship, and doesn't feel like starting afresh. However, she is swept off her feet and into the royal palace by our handsome Prince. There's humour, paparazzi, car chases, hidden gardens, pomp and ceremony and sweet romance - this book's got it all, including faith-building inspiration. Read it. You'll be glad you did!